We enjoyed a pleasant evening yesterday with friends at Steppenwolf Theater in Chicago. The play was one of the best ones we have seen. 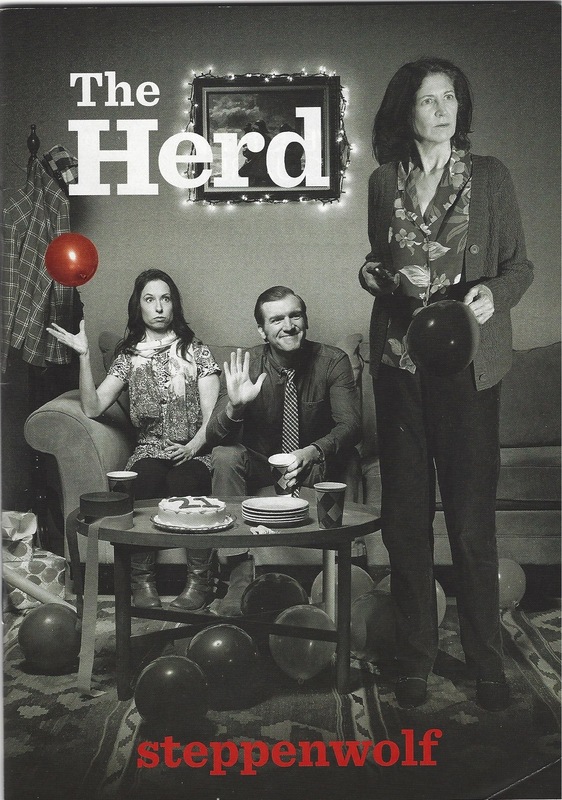 The Herd by playwright Rory Kinnear depicts a family broken and frustrated by a child born with a challenge. As the Mother put it he has the body of a twenty-one year old, but the mind of a one year old.The action takes place in the mother’s home. She lives with an adult daughter. It is the twenty-first birthday of the handicapped son, and the family convenes for a party. Grand mother, grand father, sister, sister’s live in boy friend, and a surprise visit from the father who left the mother when the boy was five. The boy himself lives with a caretaker independently. Throughout the story the mother gets progress reports by telephone from the sons weird caretaker as they make their way to the party by public transportation. The story unfolds and the microcosm of the family appears. It is a wildly funny, sad, and pathetic bunch of people who love each other, but who do little to show each other. Before the sortie ends, the daughter reveals she is pregnant by her poet boyfriend, the father feels regret for his actions to leave, and the grand father dispenses cold hard realistic advice to everyone. The audience gave this play a standing ovation, and our group of six gave it five stars.